The Kansas Wesleyan women’s eight-game winning streak appeared to be in jeopardy midway through their game Wednesday night. Yes, they had a two-point lead over a scrappy Ottawa team at halftime, but the first half had been a struggle – 35 percent shooting that included 0 of 10 from 3-point range and 3 of 10 shooting from the foul line. There also was the absence of starting point guard Haleigh Bradford (JR/Schertz, Texas), who was on the bench in street clothes with an ankle injury suffered Saturday against Saint Mary. Just as they have most of the season, though, the Coyotes found a way prevail, and it was Amanda Hill (SO/Rossville, Kan.) and Lauren Flowers (FR/Overland Park, Kan.)’ turn to step in the limelight. 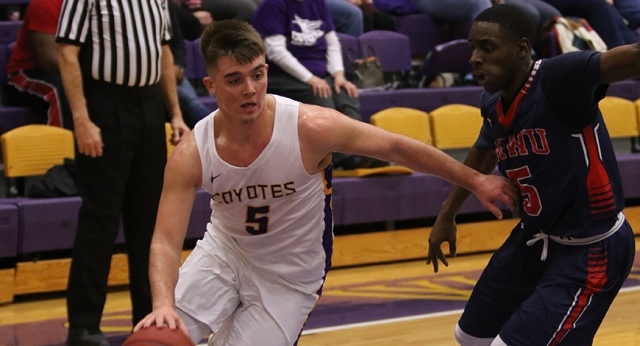 Hill, a sophomore forward, and Flowers, a freshman center, came off the bench and fueled a third-quarter surge that carried the Coyotes to a hard-fought 61-53 Kansas Conference victory at Mabee Arena. The victory, coupled with Sterling’s 70-68 loss to Bethel, vaulted KWU into second place in the conference standings with a 17-2 record, half a game behind Tabor (18-2), which edged Bethany 54-53 in Lindsborg on Wednesday. Hill scored nine of her game-high 15 points and Flowers had four of her eight points in the third quarter as the Coyotes outscored Ottawa 17-9 after leading just 27-25 at halftime. Hill and Flowers also had four steals apiece for the game. The Coyotes (19-6 overall) stretched the lead to 51-37 with 7½ minutes left in the game, but Ottawa, which had two freshmen and two sophomores in the starting lineup, responded with an 11-2 run and trailed 53-48 following a Brooke Barron 3-pointer with 3:10 remaining. Gabbie Miller (SR/Kiefer, Okla.)’s layup following an Ottawa turnover and Courtney Heinen (JR/Axtell, Kan.)’s only 3-point basket of the game with 1:29 left pushed the lead back to 58-51 with 1:29 left. Ottawa (7-16, 7-12 KCAC) got no closer than five (58-53) the rest of the game. KWU shot 37 percent from the field (24 of 65) for the game, just 4 of 20 from 3-point range. Miller scored nine points while Flowers and Kayla Kivinski (SR/Port Richey, Fla.) finished with eight points each and Heinen seven. The shooting woes didn’t completely surprise Showman. “We’d had a heck of a run where we’d shot a really good percentage and I knew that rubber band was getting pretty tight,” he said. “I think it finally snapped tonight. It was good to do it at home and still be able to get the win. The Coyotes prevailed because of their defensive play as they forced 24 Ottawa turnovers that led to 26 points and had 18 steals. Wesleyan had 15 turnovers. Ottawa shot 39.6 percent (19 of 48), but the Braves managed to stay close thanks to 8 of 17 shooting from 3-point range. Mariah Grizzle and Jenna Kramer led the Braves with 13 points apiece. Showman said he expected his team to struggle early on without Bradford, who was wearing a walking boot to protect her ailing ankle. Wesleyan plays Friends at 5 p.m. Saturday at Mabee Arena in its next contest. The Falcons (12-8, 12-13) lost to McPherson 74-63 Wednesday in McPherson. He wasn’t the leading scorer or rebounder and was just 3 for 10 shooting on the night. But Brayden White (SO/Topeka, Kan.) made his presence known in many other ways and, according to his coach Anthony Monson, was the main reason Kansas Wesleyan played its best game of the season. Led by White’s pit-bull determination on both ends of the court the entire game, the Coyotes jump to a big lead early in the game and never looked back in rolling to a 105-82 thrashing of Ottawa in a Kansas Conference game Wednesday night at Mabee Arena. Their third victory in a row, fifth in their last six game and eighth in their last 10 KCAC games moved the Coyotes into sole possession of fourth place with a 12-7 record, 14-9 overall. It was the first time KWU had scored 100 points in regulation since Feb. 2, 2013, against Bethel. Ottawa, which entered the contest tied with KWU, fell to fifth place with an 11-8 record. “Brayden White set the tone for us,” Monson said. “Just his aggressiveness, offensively and defensively, completely caught Ottawa off guard. You could see they didn’t know what to do because he typically doesn’t do that. Wesleyan raced to an 18-10 lead at the start with White scoring five points and wreaking havoc on the defensive end. Leading 32-23 with 4:50 left, the Coyotes closed the half on a 20-5 run and had doubled up the Braves, 52-26, at the break. Wesleyan erased any doubts about the outcome by opening the second half with a 24-11 burst and led 76-37 with 14 minutes left. Monson pulled his front line players with six minutes left and KWU surpassed the century mark on Brendan Ganaway’s basket with 3:02 remaining. “The first half we got great possessions every time down the floor,” Monson said. “We had only two turnovers the first half, so when you’re making them guard you for 20-plus seconds on every possession, that’s a good start. The Coyotes forced Ottawa into 19 turnovers – 14 the first half – which led to 32 points. KWU had 14 turnovers, which produced 16 Ottawa points. The Coyotes shot a sizzling 56.3 percent from the field (40 of 71), but were even better the second half, shooting 60.6 percent (20 of 33). They were 11 of 25 from 3-point range for the game. Brooks scored a game-high 24 points, 17 the first half, and was 4 of 10 from 3-point range. Jordan McNelly (JR/Salina, Kan,) continued his offensive surge with 17 points on 6 of 10 shooting, giving him 38 points in his last two outings. White and AJ Range (SO/Junction City, Kan.) each scored 10. White also had four assists, three steals and only one turnover. Ottawa shot 41.5 percent (27 of 63), including 6 of 24 beyond the arc, and was led by Mason McDow’s 16 points. Isaiah Palmer, the Braves’ leading scorer, finished with seven points, 15 below his season average.